Alberta J Jacquet obituary. Carnes Funeral Home. 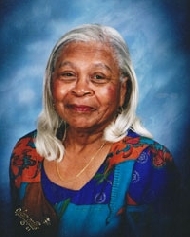 Mrs. Alberta J. Jacquet of Texas City passed away peacefully Thursday, December 20, 2012 after a lengthy illness. She was born in Howland, Texas to Carl and Jessie Sanders. She was married to Albert B Jacquet known to her as “Jack” for 55 years before his death in 2009. Mrs. Jacquet was employed at UTMB for 20 years before retiring. Mrs. Jacquet while always a spiritual woman decided later in her life to join the Catholic faith. She was a member of the Queen of Peace Catholic Church in La Marque, Texas where she joyfully attended mass until her health began to fail in early 2012. Mrs. Jacquet is preceded in death by her parents, her sisters and her beloved husband, Albert Jacquet. She is survived by her five children: Robert (Nellie), Robin (Ronald), Sonia (DeWayne), David and Regina (Lonnie). She is also survived by her fifteen grandchildren: Santresa, Xavier Dion (Marsha), Ashley, Ronald Brandon (Mercedes), Ryan, David (Denisea), Margaret, Jessica, Deonte, Douglas, Davia, Brian, Shaun, Kevin, Annissa and Andrew as well as eight great grandchildren. She is also survived by a sister-in-law whom she cherished, Estelle Glover. She leaves behind her nieces, nephews as well as many devoted family and friends. Mrs Jacquet’s greatest joy was her family. She cherished every moment with her family. For most of her grandchildren she was present from the moment of their birth and remained involved in their lives until her health restricted her activity. She was a constant figure at their school events, sporting events, birthday parties and numerous family gatherings. She showed both by her words and in her actions that she loved her children, grandchildren, great grandchildren, nieces and nephews. She became a “mother figure” to many of their friends. The family would like to publicly acknowledge the staff at Christus St John’s Hospital, the staff at Regent Care in League City, Texas and especially the staff at Bayou Pines in La Marque, Texas who made her last days comfortable and peaceful. A public visitation from 5:00 pm- 8:00 pm on Wednesday, December 26, 2012 at Carnes Funeral Home 3100 Gulf Freeway Texas City ,Texas 77591. Funeral Mass will be Thursday, December 27, 2012 at 11:00. There will be a recitation of the Rosary preceding the service at 10:30 am. Both the Rosary and the funeral service will be at Queen of Peace Catholic Church in La Marque, Texas. Interment will follow at Hayes-Grace Cemetery in Hitchcock, Texas. Funeral arrangements are under the direction of Carnes Funeral Home.